Marvel fans already have the scoop on Spider-Man: Far From Home's most recognizable villain, Mysterio (played by Jake Gyllenhaal), but they might not be well-versed on the other danger threatening to interrupt Peter Parker's Summer vacation. Namely, the four known as the Elementals in Marvel Comics lore. The Elementals are four immortal, extradimensional humanoids with power over natural forces: Hellfire, Hydron, Magnum, and Zephyr, each possessing power over fire, water, earth, and air, respectively. According to lore, they ruled a kingdom on Earth before the rise of Atlantis and were banished to another dimension when they tried to conquer Egypt. They eventually make their way back to modern Earth and frequently lock horns with Carol Danvers (which is a pretty interesting connection to the upcoming Captain Marvel film). The Elementals are seriously formidable foes with a bloodthirst that rivals most Marvel villains - though Thanos will always hold a special place in our hearts. Get Your First Look at Jake Gyllenhaal as Mysterio in the Spider-Man: Far From Home Trailer! Thanks to some subtle Easter eggs that fans caught in the trailer, some believe the villains could be a reinvention of the Amazing Spider-Man's Sandman, Molten Man, and Hydro-Man. While it would definitely be cool to see the classic villains make their collective debut on the big screen - though Sandman does appear in Spider-Man 3, played by Thomas Haden Church - the beings shown in the trailer point to Elementals more than anyone else. 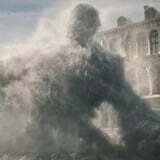 The "Sandman" in the trailer looks to be made from rocks, which is much more Magnum's ability than Sandman's, and Zephyr is shown to be creating the windstorm that Spider-Man glides through in his new suit. Though Spider-Man never encounters the Elementals in the comic book, his adventures against Mysterio might suggest a reason they're making an appearance in the MCU. In the comics, Mysterio's abilities are generally limited to his knowledge of stunt-work and special effects. He doesn't have the Doctor Strange-like powers that we glimpsed in the teaser. One of his favorite tricks is to create illusions of terrifying monsters that only he can defeat so he can play the hero and win the fame he thinks he deserves. It wouldn't be absurd to wonder if he's using the Elementals to play the same trick in Far From Home. We won't know anything more until the film comes out on July 5, but we can already tell it'll be exciting!